I’m thinking of you as Thanksgiving approaches! For many of us, pressures are mounting as we add more to our busy schedules. Family visits, even when happily anticipated, bring added stresses and tensions. It can be hard to make the decisions that are right for you and your family! 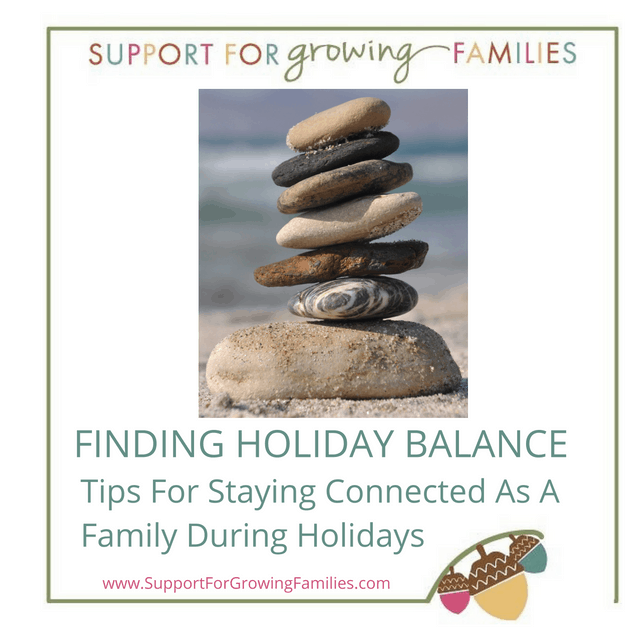 Pressure to have holidays look and feel a particular way doesn’t help. One thing I’ve learned over the years is that connection often does not equal pretty. I’ve put together some resources here that I hope will help you to feel confident in your choices and connected to your family in the coming weeks and months. This year, as always, I am very grateful to my current and former clients for sharing your joys and challenges with me, and to my colleagues for your support. Thank you, everyone, for all I have learned from each of you as you so bravely and lovingly raise your families. One of the most popular articles I’ve shared with parents is this one: It’s Okay To Stay Home On Thanksgiving. Whatever decisions you are making right now regarding travel, visitors, meal plans etc., just know that you are the expert in what you and your family need this year. You can also prepare now for your children to have some big feelings during the holidays These meltdowns can happen during or after special outings, or birthdays too. It’s not your personal parenting failure, I promise! I remember my own epic meltdown at my fifth birthday party. We had just moved and all my friends from my old neighborhood were there to celebrate with me. I got to play with them all again, and I had a lovely Barbie doll birthday cake (think cake as dress.) As everyone sang to me, and I was about to blow out the candles, I ran away from the cake and out our back door, sobbing! I don’t think I was being ungrateful, or bratty or even overstimulated. My family had arranged what was, for me a perfect day, and the attention and presence of all these people I cared about and had been missing gave me the safety to offload my feelings about how wrenching the move had been for me. My mom came out to be with me and after a good cry, I went back inside to enjoy the rest of the party. Whatever your own family’s version of holiday meltdowns looks like, here are some great tips for understanding and handling them: Holidays and Meltdowns Go Together Like Peanut Butter and Jelly. Holidays can impact breastfeeding routines as well. If you are breastfeeding, keep taking time to snuggle your babies so that you are in touch with each other and feedings don’t accidentally get missed. There is a phenomenon known as “accidental weaning” that can be avoided if you are aware that it can happen. This great article has 10 Tips To Avoid Holiday Weaning. Keep in mind also that there are a few foods which start showing up more this time of year that can adversely impact your milk supply: sage, mint and parsley. So, consider minimizing your consumption of or avoiding stuffing, peppermint treats or tabbouleh! Gift Idea For Parents: the book Listen by Patty Wipfler and Tosha Schore. Available locally from me and at Dr. Amanda Kaufman’s office. Audio book available from Hand in Hand Parenting. Free gift for new parents: New Parent Podcasts from Hand in Hand Parenting.